Honey Habanero Chicken Wings are perfect for those who love spice, sweet, and bacon. This recipe was chosen as a finalist for the Super Bowl recipe contest. 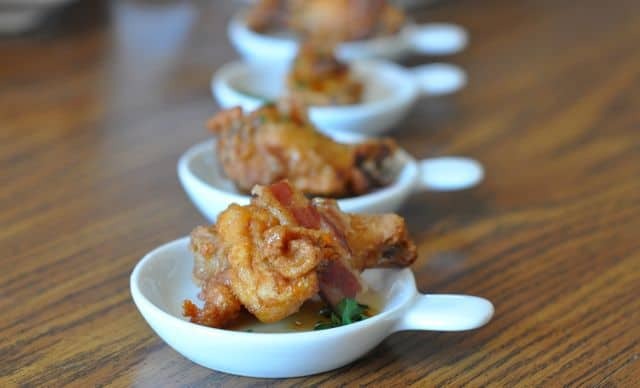 This style of hot wing is first battered, then deep fried. Then served up with a spice sweet honey glaze, and then finished with bacon. The tasters loved this recipe, and kept going back for seconds. I have to tell you, we regularly go out for hot wings. I would encourage you to cut up your own wings for this recipe. It will help you save money, and it will literally take two to three minutes to cut all of these wings and get them ready. After I finished this recipe I drizzled the extra sauce on top, and then served up the sauce on the side. Be careful when cutting up the habenero, they are one of the hottest peppers around. I would suggest you wear gloves if you. Also, do not touch any body parts until you have washed and rinsed your hands extensively first. These honey Habanero Chicken Wings have the perfect amount of sweet and heat. Preheat oven to 350 degrees. Preheat oil to 350 degrees. Remove chicken from packaging and dry with paper towels. In a large zip-top bag, mix together: flour, salt, black pepper and smoked paprika. Shake to incorporate. Drop the chicken wings into the flour mixture and shake to coat chicken. Shake off excess flour and drop chicken wings into the hot oil. Fry for 10-15 minutes or until chicken is no longer pink in the middle. Remove from oil and let drain on paper towels. In a mixing bowl, whisk together: honey, apple cider vinegar, and habanero pepper. Dip each chicken wing into the sauce and then place onto a baking sheet. Bake chicken for 5 minutes, remove from oven and immediately sprinkle with crumbled bacon. I tried this recipe and served them to a house full of men during the last party we had. All of my guests just loved them. I was sorry I didn’t make more. This recipe should win for sure!!!!! They are easy to eat and serve as well. In our house the habenaro wings would be the winner!